The relationship between the two men has come under scrutiny as Buttigieg’s campaign becomes a surprise hit, raking in $7 million during the first quarter. As he formally launches his White House campaign on Sunday, the gay mayor has emerged as a celebrated voice for LGBT equality and religious tolerance. 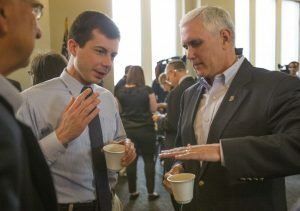 And Buttigieg has hardened his rhetoric toward Pence, using President Trump’s vice president as a foil representing an oppressive opposition. For example, one of Pence’s last major policy achievements as governor was a program that awarded funding to several regions for redevelopment, including $42 million for the greater South Bend area. During a ceremonial 2016 groundbreaking at a long-shuttered Studebaker factory, Buttigieg and Pence stood side by side and shook hands after scooping dirt with their shovels.